1. What is Demand Response? 2. What is Automated DR? 4. What is the OpenADR Alliance? 5. Are there any OpenADR deployments? 6. What are the benefits of OpenADR? 7. How do the OpenADR Alliance’s activities differ from the work within OASIS? 8. How do the OpenADR Alliance’s activities differ from the work within NAESB? 9. How do the OpenADR Alliance’s activities differ from the work within UCAIug? 10. How does the OpenADR Alliance differ from other industry alliances? 11. Energy Interoperation (EI) is a new standard from OASIS. Where does OpenADR fit into this specification? 13. Is OpenADR an international standard? 14. Where can I get a copy of the OpenADR 2.0 specification? 15. What distinguishes OpenADR 1.0 from OpenADR 2.0? 16. What features do the OpenADR 2.0 Profiles a, b & c offer? 17. What is a VTN? 18. What is a VEN? 19. Can a VTN be a VEN? 20. Can I certify a server that accepts an OpenADR 2.0 message and then forwards a proprietary message to client device? 21. What is the difference between OpenADR 2.0 and SEP 2.0? 22. Can OpenADR be used in residential applications? 23. Can I mix and match OpenADR components, or do I need to stay with a single manufacturer? 24. How is cyber security supported by OpenADR? 25. How does a company get its products certified as OpenADR-compliant? 26. How can I tell if a product has been OpenADR certified? 27. When will the test tool be available? 28. When can we expect to see the first certified OpenADR 2.0 products? Automated Demand Response (Auto-DR) consists of fully automated signaling from a utility, Independent System Operator (ISO), Regional Transmission Operator (RTO) or other appropriate entity to provide automated connectivity to customer end-use control systems, devices and strategies. Auto-DR does not require full automation on the customer end. Open Automated Demand Response (OpenADR) is an open and interoperable information exchange model and emerging Smart Grid standard. OpenADR standardizes the message format used for Auto-DR so that dynamic price and reliability signals can be delivered in a uniform and interoperable fashion among utilities, ISOs, and energy management and control systems. While previously deployed Auto-DR systems are automated, they are not standardized or interoperable. The OpenADR Alliance is a mutual benefit corporation created to foster the development, adoption, and compliance of the OpenADR Smart Grid standard. OpenADR-based solutions will standardize, automate and simplify the use of Demand Response (DR) worldwide – making DR a more reliable and cost-effective resource to help utilities meet growing demand for energy, and giving customers greater control over their energy future. While the benefits of widespread DR adoption are clear, the industry to date has lacked an organization responsible for the education, training, testing, and certification needed to bring this technology to market. The OpenADR Alliance currently has over 100 members including utilities, software suppliers, device manufacturers, national labs, DR aggregators, testing and certification labs, system integrators and consulting firms. Members get support from the Alliance’s technical and marketing committees to enable shorter development cycles. Members get early access to specifications and have the opportunity to influence the evolution of the OpenADR standard. Members also have the opportunity to certify their products as OpenADR-compliant. Over 60 utilities and controls vendors have already announced or deployed OpenADR-based systems across the U.S. and internationally. OpenADR adoption will benefit a wide range of stakeholders. - OpenADR-based DR capacity is a more predictable DR resource for utilities to use during times of grid stress. - DR helps defer the need for new generation, and OpenADR-based DR systems give utilities greater confidence that DR resource will respond when called. - Many states have implemented peak load reduction goals. OpenADR-based solutions typically produce a larger and more consistent kW reduction than other approaches, which helps utilities achieve peak reduction targets. - CPP tariffs can increase kWh costs dramatically during events. OpenADR-based systems help customers automatically reduce usage during events to minimize dynamic pricing impact. - Many customers today participate in DR programs. OpenADR-based systems will help customers and third party aggregators capture additional DR capacity from discretionary loads with minimal impact on operations or occupant comfort. - Most utilities provide incentives to install DR systems, and many provide enhanced incentives for fully-automated systems. OpenADR helps customers install new systems that typically offer ongoing DR, EE and peak demand reduction benefits. - OpenADR-based systems will compete effectively against proprietary systems in the market due to the higher incentives paid by utilities. - OpenADR-based systems will offer quicker, easier installation & operation, and will help enable direct market integration in competitive electricity markets. - OpenADR-based systems help customers control costs and maximize the value of their discretionary electric capacity. OASIS (Organization for the Advancement of Structured Information Standards) is a not-for-profit consortium that drives the development, convergence and adoption of open standards for the global information society. OASIS published a standard called Energy Interoperation 1.0, of which OpenADR is a profile. The OpenADR Alliance is utilizing existing standards from OASIS including Energy Interoperation, Energy Information Exchange (EMIX) and WS-Calendar to create a fully defined, implementable, and testable standards..
UCAIug (Utilities Communications Architecture International Users Group) is a not-for-profit corporation focused on enabling utility integration through the deployment of open standards by providing a forum in which the various stakeholders in the utility industry can work cooperatively together as members of a common organization. The OpenADR TF within the OpenSG (Open Smart Grid) Technical Committee has been focusing on working with OASIS and NAESB to develop business requirements, Service Requirement Specification and Service Definitions for the OpenADR standard. The OpenADR Alliance is the only organization focused on developing, certifying and promoting standards-based DR solutions. The OpenADR Alliance works with other industry alliances as appropriate to promote these goals. OpenADR is a subset of the Energy Interoperation standard in the form of a profile. However, the goal to EI is more than DR, it includes transactive markets, and pricing beyond what the current market design requires. Hence, market-based implementations of EI do exist; however, there will be only one implementation for DR using the OpenADR 2.0 standard. The original OpenADR version 1.0 specifications were published by Lawrence Berkeley National Laboratory (Berkeley Lab) and funded by the California Energy Commission’s Public Interest Energy Research (PIER) program after 7 years of research in Auto-DR. OpenADR is being further developed through the NIST Smart Grid-standards effort, along with organizations including: Organization for the Advancement of Structured Information Standards (OASIS), the Utilities Communications Architecture International User’s Group (UCAIug), and the North American Energy Standards Board (NAESB). The current OpenADR Version 2.0 specification is being developed by the OpenADR. The International Electrotechnical Commission (IEC) has approved the OpenADR 2.0b Profile Specification as a Publicly Available Specification (PAS) IEC/PAS 62746-10-1 as a basis for a new commission standard to be developed. The level of international support for the PAS validates the global importance of the OpenADR smart grid specification. The OpenADR Alliance is also collaborating with several IEC committees – TC 57, PC118, and TC 65. The OpenADR 2.0a and 2.0b profile specifications and schemas can be downloaded at via the Alliance web site at https://openadr.memberclicks.net/specification. 16. What features do the OpenADR 2.0a and b Profiles offer? Profile A: Is designed for resource-constrained, low-end embedded devices that can support basic DR services and markets. Profile A is well suited to support standard DR programs. Profile B: Is designed for high-end embedded devices that can support most DR services and markets. Profile B includes a flexible reporting (feedback) mechanism for past, current and future data reports. VTN stands for – Virtual Top Node. 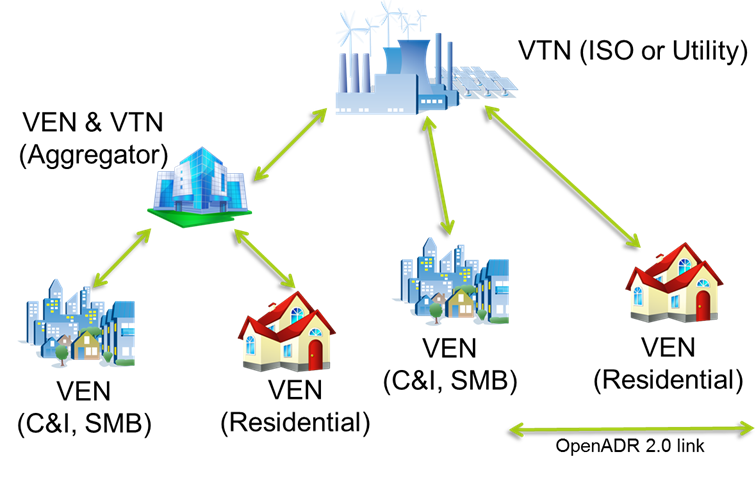 A VTN is typically a “server” that transmits OpenADR signals to end devices or other intermediate servers. VEN stands for - Virtual End Node. A VEN is typically a “client” and can be an “Energy Management System” (EMS), a thermostat or other end device that accepts the OpenADR signal from a server (VTN). Yes. A VTN and VEN can be the same device. For example a DR aggregation server can act both as a VEN for a utility DR signal, and as a VTN for end devices. Yes. For example, the same device may be OpenADR certified as well as Wi-Fi® or ZigBee® certified. OpenADR can be implemented in applications that serve all market segments. There are existing examples of implementations deployed in Commercial, Industrial and Residential markets. The OpenADR standard allows uniform and stable interoperability between devices. By creating standards-compliant devices and systems, customers will have choice between products and among vendors. OpenADR 2.0 supports ECC and RSA server and client certificates with TLS and XML wrapping functionalities. Intertek (www.intertek.com) is the testing and certification laboratory for the OpenADR Alliance. Only Alliance members are allowed to have certified products. The OpenADR Alliance maintains a database of certified products on its website, and will manage the branding and logo process to ensure consistent and accurate use of the OpenADR Certified logo. 27. Where can I learn more about the OpenADR 2.0 test tool? The OpenADR test tool is available for members and non-members to certify products to the OpenADR 2.0a and OpenADR 2.0b Profile Specifications. More information can be found here. 28. Where can I see a list of certified OpenADR 2.0 products? The latest list of OpenADR 2.0a and b-certified products can be found here.